Adina: Let’s apply this to this imaginary situation: Jane just got off the phone with a family member. They had a heated argument about something. She’s feeling hurt, she’s feeling like she wasn’t heard at all and is angry about it. Feeling overwhelmed by negative emotions, she heads to the freezer to pull out a carton of ice cream and goes sit on the couch and zone out to Netflix. Can you help readers visualize what it might look like in practice, for Jane to do things differently? Lilia: This is actually not imaginary at all! I don’t know about you, but I’ve certainly been there, many times, and I’m sure a lot of people reading this can relate. There are a couple of ways this might look differently, depending on the specific situation and context, but I’ll share one that works best for me. So the first step is to acknowledge and name what is here. What emotion is present? Then, feel into my body, and explore where in my body is this emotion lodged? Where is it manifesting? I can sense into location, size, temperature. Just notice, what is here? Because anger is a difficult and unpleasant emotion, the bodily sensations usually are too, and I often find myself resisting it. So here I do one of my favorite practices, rooted in mindfulness and compassion. It is called Soften, Soothe and Allow, and it’s part of the Mindful Self Compassion program by Kristin Neff and Chris Germer. (Although this guided audio is about 15 minutes long, you can do a shorter or longer practice) So the practice involves, first, softening the resistance to what is here. Then, I soothe myself because this is painful. I comfort myself the way I would do a beloved child or pet, with kindness, with warmth, maybe with some loving words. And then I continue to simply allow what is here. 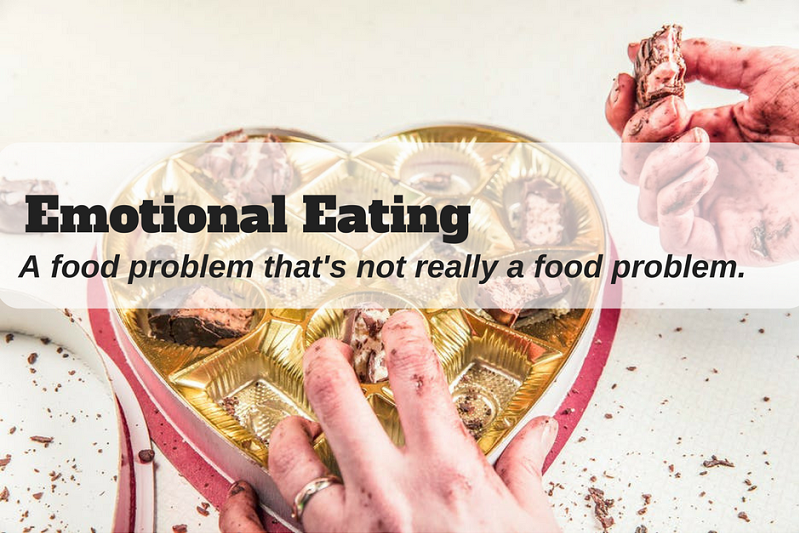 I find the soothing component particularly important, because when we’re talking about emotional eating, that’s really what we’re looking for, and there’s a wisdom in that. When we eat, we are doing something that our body knows triggers the relaxation response. Breathing with our pain and soothing ourselves with kindness also triggers this relaxation response. After this, I can usually find myself with more ease to explore self-care options that will help me address my emotions in ways that will best meet my needs. Sometimes this can look like calling a trusted friend who can offer empathy, or curl up with a good book and a cup of tea, or play with my cat. Sometimes it will look like helping myself to a small scoop of ice cream and sitting down to fully enjoy it, savoring it. And sometimes it will look like eating ice cream from the carton while watching Netflix, offering myself some compassion because this is the best way I can take care of myself this time around. The thing about mindfulness is that it’s about opening space for choice and freedom, and sometimes the behavior will look the same but it’ll come from a different place, or we’ll relate differently to it. And also, change doesn’t happen overnight. Something that I feel is essential to say here is, no matter how much we read about it or think about it, the only way to learn mindfulness, like anything else, is by practicing. And it really helps for your mind to create a habit at moments when you’re not particularly stressed. That is to say, if someone is completely unfamiliar with a mindfulness practice, creating the expectation that in Jane’s scenario, just by willing it so, she will immediately turn to the Soften, Soothe and Allow practice, or even to another action to take care of herself, is unrealistic, and creates the perfect opportunity for guilt and shame that she couldn’t choose differently. We need to create a new habit, and this literally takes creating new neural pathways. So Jane might start sitting with her breath for a few minutes everyday, simply observing curiously whatever is here in sensations, thoughts and emotions. Or she might invite herself to check in with her body two or three times a day and name what emotion is here. Or she might choose to to bring forth a difficult emotion (one that is not overwhelming) to practice Soften, Soothe and Allow everyday for a few minutes. And, as you know, daily life is never short of frustration, sadness, anger, and other difficult emotions, so we have plenty of opportunities to practice. So, after a while, Jane’s mind-body will have learned to go to this practice when something difficult comes up, and then she has a choice. Adina: Like you said, just reading about something can give us the false sense that we’re prepared and it will be easy once we try it. So if someone is reading this and thinking “I love this! I’m going to do this from now on!” What is a realistic expectation for how well this will work and the practice involved? Lilia: Exactly! So, a few things to keep in mind. It is always difficult to create a new habit, and emotional eating is there both for evolutionary reasons and for personal ones. It is always, always, rooted in wisdom, and might have become the default throughout a period of years. I think the biggest thing I’ve learned from my practice – and it is still a huge challenge – is patience. Please be patient with yourself, this takes time and a continual renewing of intention. Also, contrary to what some sources have portrayed, mindfulness is not the shortcut to pure bliss. Because, once again, it is about befriending and creating space for the whole of our experience, more often than not what we will find is discomfort, but we will be increasingly skilled to relate to it differently. We must be willing to, as Jon Kabat Zinn has so brilliantly put it, embrace the full catastrophe that is life. In terms of practice, I would say a daily practice of even a few minutes is necessary. This practice allows you to cultivate the ability to sit with your feelings without automatically reacting to them. With time, you may find that the amount of food you eat in an episode of emotional eating is less than it used to be, or that you were able to check in with your hungers and choose to do something other than eating. Or that your inner dialogue is less critical when you do eat emotionally. And the space of freedom keeps growing with our practice. In periods of increased stress or significant loss, it might change. I really want to stress that our practice is not focused on outcomes, but on how we relate and are open to life, including what we think of as ugly and painful. From what we know from research, and what I’ve seen in myself and participants in the programs I teach, about 6 weeks of sustained practice bring about a meaningful shift. Again, this might look differently for every person. Another thing I would like to mention is the importance of teachers and community. Teachers can offer guidance, and they’ve already walked part of the path. Community helps us renew our intention, and sustain our practice. We can offer each other empathy when we struggle, rejoice in our growth and learning, and remind each other of our common humanity. So, if you would like to start a practice, find a teacher you resonate with and a community that helps you feel safe and brave. Adina: Anything else someone should know when they are trying to learn to better cope with big emotions? Lilia: You are not alone in the experience of suffering, it is part of our being human, and we all struggle. That being said, coping with big emotions is harder for some, particularly if you have experienced significant trauma in your life, including oppression from living in a certain body. If you feel overwhelmed, please reach out to someone who is skilled, who has experience and can help. Mindfulness is sometimes portrayed in the media as a cure-all, as an easy technique that will make anyone and everyone feel great immediately. Be suspicious of any source that paints this picture. It is not a magical cure or a quick fix. Also, small steps. One of my very wise teachers always says: “one breath at a time, one step at a time, one bite at a time”. Thank you to Lilia Graue and her gracious sharing of her expertise in this area of mindfulness. I want you to know a little about her Community Clinic. Mindful Eating Mexico’s Community Clinic offers mindfulness and compassion based clinical services, coaching, therapeutic conversations and consulting in the field of eating, body, and weight related concerns on a sliding scale basis, starting at US$35 per session. They offer all of their services for the general public and health providers online in both Spanish and English, and welcome humans of all sizes, gender identities, sexual orientations, races, ethnicity and religions, with a special focus on Latinxs. You can also reach Lilia at liliagraue@mindfuleatingmexico.com. 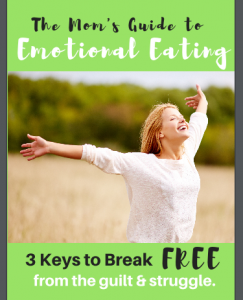 If emotional eating is something you want to start working on, you can find my free 16-page guide for managing emotional eating here. It was created with moms in mind, but even if you are not a mom, you can still use the strategies to help you normalize your eating pattern in a healthy way.